The Olive (Pacific) Ridley Turtle is listed as endangered. It is the smallest sea turtle, and is not commonly seen and nests in low numbers along the Gulf coast of Queensland. Their heads are large and massive. In Australia, major breeding aggregations occur along the coast from southern Queensland and the Great Barrier Reef, northwards to Torres Strait, the Gulf of Papua, Gulf of Carpentaria, Arafura Sea and Joseph Bonaparte Gulf in Western Australia. Hatchlings are dark gray with a pale yolk scar, but appear all black when wet. Olive ridley turtles are best known for their behaviour of synchronized nesting in mass numbers, termed arribadas. Size & Weight: Adults measure 60 to70 cm in carapace length. Adults weigh between 35 and 45 kg. Diet: They have powerful jaws that allow for an omnivore diet of crustaceans (such as shrimp & crabs), mollusks, jellyfish, tunicates, fish, crabs, rock lobsters and shrimp. They will feed on feed on filamentous algae in areaswhere other food sources are scarce. Habitat & Distribution: Generally found in coastal bays and estuaries, but can be very oceanic over some parts of its range. They typically forage off shore in surface waters or dive to depths of 500 feet (150 m) to feed on bottom dwelling crustaceans. 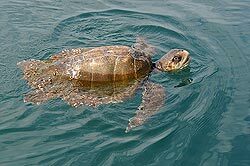 The olive ridley inhabits tropical and subtropical waters of the Pacific, Indian and Atlantic Oceans. Found in the Indian Ocean along the Bay of Bengal is Orissa. Average weight of the turtles is just over 100 lb (up to 50 kgs). 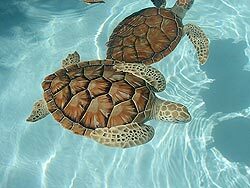 They have a high-domed shell, with a carapace length of only 30 inches (70 cms). Olive Ridleys are omnivorous, feeding on crabs, shrimp, rock lobsters, sea grasses, snails, fish, sessile, pelagic tunocates and small invertebrates. The Orissa coast is one of the three sites worldwide where mass nesting of the Olive Ridley Turtle occurs. 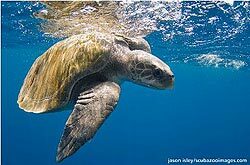 This sea turtle is especially known for its mass nesting when several thousand turtles migrate to the breeding ground to mate and nest simultaneously. Hindu mythology worships sea turtles as an incarnation of one of their gods. Over the past five years, sea turtles have suffered mass mortality along the Orissa coast due to death by drowning as incidental catch in trawl - fishing nets. About 5,000 to 10,000 dead turtles have been washed ashore each year, a total of over 1,00,000 in the last 10 years.